Helm: The monkey that played the character Caesar must be uncanny smart. If he is any indication of how far monkeys have advanced recently, then the planet may actually be at serious risk of take-over by primates. Mathew: He wasn't a real monkey. Helm: Surely you jest. He was a far better performer than the human playing the lead role. Mathew: James Franco? Yeah, he kinda sucked in this film. Helm: I liked him quite well in Your Highness and in that film Milk, and yet you mean to tell me that he was outperformed by a pretend monkey? I find that hard to credit. Mathew: And yet it's true. I thought he was one of the worst parts of the film, which I kinda liked otherwise. Helm: I did not enjoy the film as much. The logic flaws were troubling. Helm: What about that incident near the beginning involving the female monkey? There is no way that a medical research facility could have missed something like that. Helm: And the number of apes involved seemed to magically grow. Mathew: Okay, sure. That's two. Helm: And, were we supposed to believe that one or more full grown silverback gorillas actually travelled through the tree tops along a city street? They would have plummeted to their deaths! Mathew: Okay, fine! But I still liked this movie. I liked that the filmmakers seemed to care about the universe set up in the first Planet of the Apes films. I liked that they knew the details and incorporated them into the film. I liked that they had some fun with it and put in a few tributes to those earlier works. Didn't you like any of that? 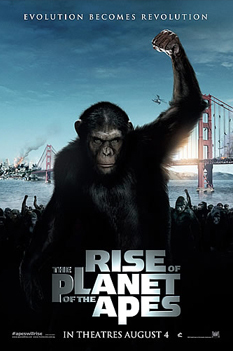 Helm: I liked that the filmmakers addressed the primary issue--that the number of great apes currently on the planet would not be sufficient to prevail in a military overthrow of the existing human population. Mathew: THAT was your primary issue? Helm: Yes. The total great ape population of the planet stands somewhere around 350,000 individuals, while the human population is approximately 6.94 billion individuals. That's 19,828 humans for each ape. I do not like those odds. Only if every ape wore headgear similar to myself could they possibly hope to prevail, and I am the only Helm in this universe. Mathew: I hadn't thought of that. Mathew: Only three flaming swords? Helm: Why was there such a big primate storage facility in San Francisco? Helm: Who did those primates belong to? Helm: If the facility was some kind of primate rescue facility, like Save the Chimps in Florida, then they would not have been involved in supplying medical specimens. If it was a facility for providing primates for research, then they would not have taken in rescue chimps. The only conclusion is that it was a primate facility designed by screenwriters to be convenient for Rise of the Plant of the Apes. Mathew: Okay, but I still thought it was a good movie. Helm: But not a four star movie.